Hello everyone. When we first did our pre wedding session, I knew this wedding will be full of action and emotional images. These guys are so meant for each other. I love the story how they met and how Stephen exchanged place cards around the table to get to sit next to Liana. Also how on the same night Liana went face down during the some wild evening dancing :) How Stephens hobby is jewellery making and apparently Liana is awesome tennis player. All these small details makes them so special for each other. Today I will share with you some beautiful Balbirnie House Hotel wedding photos. This was my second time at this pretty venue and I look forward to work there more. Here is what Stephen and Liana said about their day. “Not having thought much about weddings before planning our own, we didn’t really know what to expect from the day itself. One thing we knew was that our wedding day was going to be very busy, but we didn’t realise it would pass so quickly! To start the day, we both got to have fun getting ready with our bridesmaids and groomsmen. What better way to calm any nerves than having good friends and family at our side. Liana, Susie, Mhairi and Ruth loved having Stephen’s sister Julia help with their makeup! Liana was delighted to get some pictures with her Nonna, mum and dad by the piano. It’s lovely to say that Armands and his second, Kirsty, were a great addition to the party. Our ceremony was made special and personal to us with the guidance of our humanist celebrant Duncan Robertson (Stephen admits he felt quite emotional and had a wobbly chin when Liana was walking down the aisle with her dad). We wanted the day to be bright and colourful with a joyful feel – and with beautiful flowers from Jack Fleuriste and bouncy jazz from the 78 band we really felt that’s what we got! Later we had a great time jigging to ceilidh music from “it’s no reel” and were happy to see our family and friends were as excited as we were by the Lovecrumbs cake table! Liana notoriously loves cake. Her mum’s beautiful homemade fruit cake with crystallised petals really topped off the cake table. Balbirnie House was a fantastic venue and nothing was too much trouble for the efficient and helpful staff. They were even able to source a specific Polish cherry vodka for us to serve after dinner! It meant the world to us to be celebrating this day with our family and friends. It was fantastic to see everyone getting to know one another during the day then ceilidhing the night away. In the wonderful whirlwind of the day, we did manage to find a few quiet moments to reflect. We were very lucky to spend a lot of these with Armands whose great chat kept us laughing from picture to picture. We wanted to give everyone who came a little something to take away with them as a thank you for celebrating with us. We had a great time making all the coin cufflinks and stamp brooches (Stephen’s ByJove designs came in very handy!) It was even better when we realised that some guests brooches perfectly matched their outfits! I was really excited to photograph some nice portraits of Liana and her relatives. We took few photos at the hotel and headed out to Lianas parents house to take some more portraits. When I first saw her wedding dress, my jaw dropped. I really loved simplicity of this dress. So elegant and fitted Liana amazingly. It was dress from Rachel Scott Bridal Couture in Edinburgh. One more very talented Edinburgh wedding dress supplier. Ceremony was real fun and Duncan did amazing job with telling stories about Liana and Stephen. Loved it. Full hair of confetti and plenty of smiles during the group photos. Of course after that it was time to do some creatives. Love Balbirnie House how versatile it is. From photographers point of view you have so much to do inside and also outside. Lots of opportunities to create beautiful wedding images. Some fast paste first dance and evening was finished with few pretty evening photos. I know it was long photo story, but I hope you enjoyed looking trough the photos. It tell well how the day went and those who are looking to have a wedding at Balbirnie, definitely go for it. Thumbs up wedding venue. Thank you to my second photographer Kirsty and to the awesome staff and Balbirnie house. 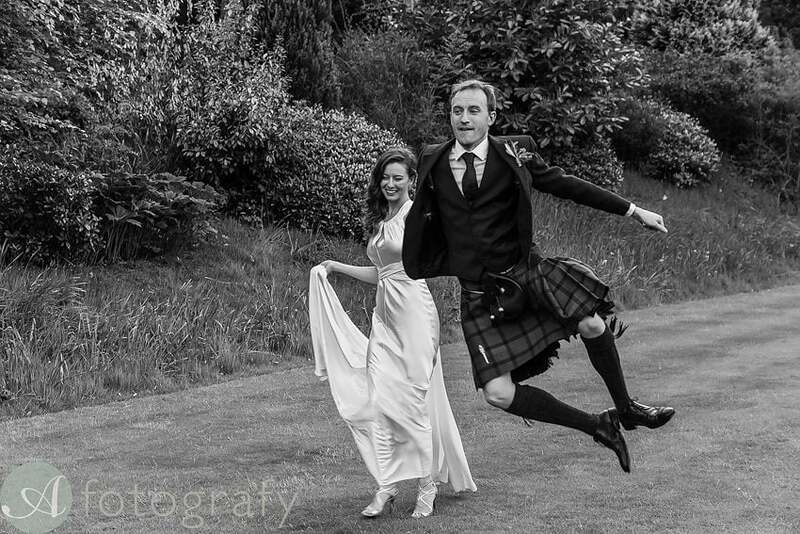 Awesome fun creating Balbirnie house hotel pre wedding photos.